I've created the following kits to work in conjunction with the Never Before Seen Promotion. All kits must be ordered by August 31, items ordered will be shipped no later than September 14th. Please email me with any questions, or if you'd like to order additional items with your class kit. Create 8 Love Notes with a coordinating box, using the Pocket Silhouettes stamps and designer series paper! Note - only the above items are included in this class kit, you'll supply all card stock and inks and other items needed to complete this class. 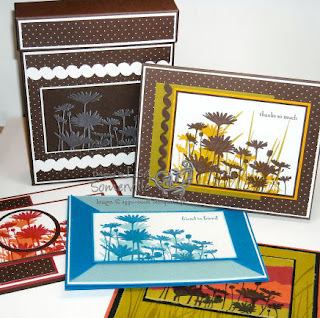 Learn some great techniques as you create this A2 sized card box and cards using the Upsy Daisy Stamp set. Note - only the above items are included in this class kit. 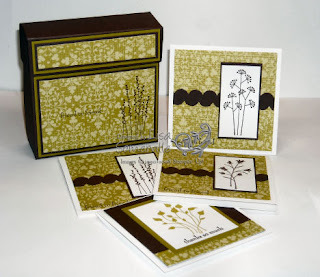 You will supply all card stock, inks and other items needed to complete this class. Other stamps used, but not included in the Upsy Daisy Kit - Inspired by Nature, Pocket Silhouettes.